Regular readers of this blog will know that I like to go bush quite often, on short walks or weekend camping trips, and have visited a good number of National Parks and other locations in the last few years. A couple of weeks ago I was wondering where to go next and remembered that my favourite bookshop had featured this guidebook on its facebook page. I trust my bookshop and this publisher (CSIRO seems to publish every second nonfiction book I buy) so ‘problem solved’, I thought, and went shopping forthwith. Walks, Tracks and Trails turned out to be every bit as good as I had expected. In typical CSIRO fashion, its layout and design are exemplary. 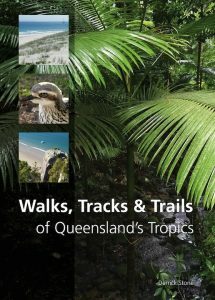 Overall, the book follows a South-North logic, with walks grouped around the major population centres from Rockhampton to Cooktown; each region has its own overview map and is colour-coded on the edge of each page for quick reference; and within each zone, each adventure gets a map, photos, brief track notes and a few paragraphs about why it’s worthwhile, generally across a two-page spread. One test of a reference book is to see if it agrees with one’s own knowledge. Wallaman Falls? Cape Hillsborough? The Forts walk on Magnetic Island? All accurately portrayed. Another test is to see if it includes something one doesn’t already know but can make sense of. How about the walks from Paluma Dam? Yes, I think I could find them and follow them. Conversely, does it miss out anything I do know about? Well, around Townsville it deals adequately with the Common, Magnetic Island and Castle Hill but doesn’t mention the walking/biking tracks which follow Ross River from the city to the Dam, so there may be similar gaps in other regions. The coverage of the Atherton Tablelands is very good but Western Queensland is explicitly outside the scope of the book: it does venture over the watershed, but only just, covering Mount Fox but not Charters Towers or White Mountains. I’m not going to complain, however, since its 280 pages must describe more than 120 walks, from twenty-minute strolls to tough hikes taking four or five days. Walks, by the way, are graded ‘easy’, ‘medium’ or ‘hard’, and one of my few quibbles is that ‘hard’ covers too broad a range, from Mount Fox (steep and rubbly but a short and very straightforward walk) to the Juwun Walk (40km of unmarked track down the Herbert River gorge). True, Stone does add guidance such as, “suitable ONLY for experienced and self-sufficient hikers with high fitness levels,” but a ‘moderately hard’ category might have been useful. It’s a good problem to have. And this is a good book to have. 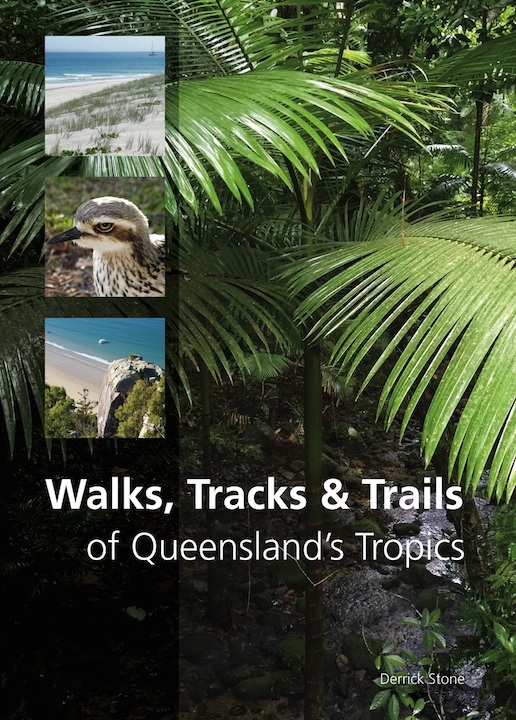 “The Bowling Green Bay National Park (near Townsville) is a southern outlier of the Wet Tropics bioregion and has rainforest growing at its summit as well as along the various creeks.